Marbella is not defined by its sleek nightclubs and beach bars. From its wonderful seafood to one of southern Spain’s best shopping scenes, there are plenty of other things going for this Mediterranean city. Read on for why you should visit Marbella at least once in your lifetime. Marbella is preceded by its reputation: it’s just a glitzy party town, full of plush nightclubs and bars where celebrities mix with Middle Eastern royalty. Right? Not really, as it turns out. Marbella is often conflated with the Golden Mile and Puerto Banús (see below), both of which lie outside the city itself. A trip here will enable you to see for yourself whether Marbella city deserves the reputation it has as a party town and little more. If you like city beaches, then a trip to Marbella won’t disappoint. It boasts some excellent playas, all of which back onto bars, cafés and restaurants to suit every taste. The main stretch of sand is the Playa de la Fontanilla, which runs along the Paseo Maritimo and the southern edge of Marbella; if you head further west, beyond the city centre, you’ll find the city’s fishing quarter and the lovely Playa Bajadilla. A little-known fact about Marbella is that it has one of the prettiest old towns in Andalusia. This compact barrio extends up the hill from the ringroad and its flower-filled streets and colourful squares provide ample opportunities for becoming lost. Its central square is the Plaza de los Naranjos: filled with the dainty orange trees for which southern Spain is famous, it’s the perfect place to stop for tapas as you explore. 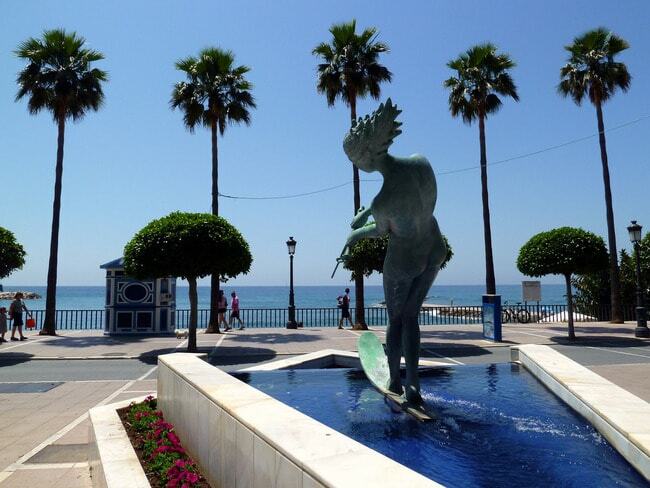 There is much more to Marbella, though, than its oldest quarter. Surrounding the casco antiguo are residential neighbourhoods that form the soul of the city. Miraflores (north of old town) will charm you with its street fruit and veg stalls, which serve as morning meeting points for the locals, while Divina Pastora (east of Represa Park) boasts one of the city’s liveliest food markets and a church with paintings of the eight provinces of Andalusia. Salvador Dalí (1904-1989) never lived or worked in Marbella, so there’s no particular reason why the city should have one of the world’s finest collections of his sculptures. Nevertheless, on the Avenida del Mar – a spacious square by the sea surrounded by modern apartment buildings – you can find ten of the Catalonian surrealist’s bronze works, in all their bizarre beauty. Even better, it won’t cost you a cent to stop off and marvel at them. If you’re staying for more than a day in Marbella, you’ve time to spend a morning cycling alongside the Mediterranean. Rent a bike from one of the city’s many bike shops – Marbella Bike is handy as it’s right by the beach – and cycle along the excellent coastal path that takes you out of the city and towards the (in)famous Puerto Banús marina. It’s a gentle ride of 8km (5 miles) and offers wonderful ocean views to your left as you cycle. When you reach Puerto Banús, you’ll have the opportunity to make your mind up about the glitzy marina that gives Marbella its reputation as a millionaire’s playground. Its small port is packed with yachts the size of houses, while unblemished Ferraris creep along its boutique-lined streets. There’s even a quayside petrol station for boats. Love it or hate it, you will certainly come away with an opinion about Puerto Banús. Most Andalusian cities hold their annual ferias on big sanded fairgrounds out of the city centre. During Marbella’s June Feria de San Bernabe, though, the partying also takes over the streets: there are flamenco performances, live concerts of every kind of music, fireworks and, of course, lots of drinking and dancing. It’s a great time to visit the city, and to see the local women attending the street parties in their finest flamenco attire. Marbella is not just about partying, but that’s not to say that those who come here for the nightlife will find it wanting. There is a profusion of late-night bars and clubs behind the Paseo Maritimo – Bar Buddah is one of the most famous – but the real party scene lies slightly west of the city. Clubs along the “Golden Mile” host the world’s leading DJs every summer, whilst Puerto Banús offers venues for every kind of party animal. Beautiful as Marbella’s old town is, it’s not just a neighbourhood of charming old buildings. This small chunk of the city is also home to one of southern Spain’s best shopping scenes (although not for shoppers on a budget): its streets are packed with classy boutiques selling everything from clothes to jewellery, shoes to artisan gifts and souvenirs. The neighbourhood almost feels like an unbelievably attractive, open-air shopping mall. Located about 10km (6 miles) to the east of Marbella, Nikki Beach is an exclusive resort and club that opened in 2003; since then, it has become one of the most famous hangouts on the Andalusian coast (and one of the priciest, too). White leather “VIP” loungers lie on the sand under palm trees, facing the Mediterranean, and refreshments are available from sleek open-air bars and restaurants. No visit to Marbella would be complete without sampling its wonderful seafood. You’ll discover your favourite whilst wandering around, but La Lonja is a popular spot for the locals, whilst Restaurante Puerto Playa is perhaps Marbella’s best-appointed seafood joint: located in the fishing neighbourhood, it has tables out on the sands of Playa Bajadilla. As with many of Marbella’s chiringuitos, fish are often cooked here over an open fire on the beach.